When you own a diamond tennis bracelet, you want to enjoy the eye-catching sparkle it creates on your wrist. Proper cleaning is important to remove everyday buildup that collects on your bracelet from dirt and oil on your body as well as from soap and lotions that you use throughout the day. Without periodic cleanings, the bracelet will lose its beautiful shine. 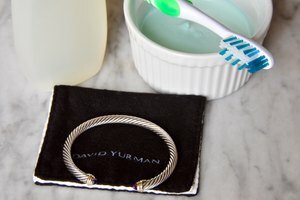 If you do not want to go to a jeweler or spend money on a jewelry cleaning kit, use a simple at-home method for an inexpensive and convenient way to clean your bracelet. Mix the dish detergent with warm water in a small bowl. You only need about an inch of water to cover the bracelet and just enough detergent to make bubbles. Allow the bracelet to soak in the bowl for about 15 minutes. Use a soft toothbrush to gently scrub the diamonds over the bowl. 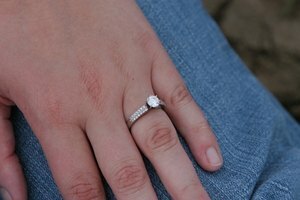 Get all around and between the diamonds while being careful around the prongs. Rinse the bracelet in warm water over a mesh strainer. The strainer allows you to catch any diamonds that may have been loose and that fall out during the cleaning process. Pat dry with a lint-free cloth. Be careful not to get the fabric caught on any prongs. Pour the soapy water through the strainer. Watch for any diamonds that have fallen out. This method of cleaning will not cause the diamonds to become loose, but if a diamond is already loose and falls out in the bowl or while rinsing, you will catch your diamond in the strainer and can have it re-set. Take your bracelet to a professional jeweler at least once a year to be professionally cleaned and inspected. Do not wear your bracelet when cleaning, showering, applying lotion, or gardening, as this increases the residue that builds up on your bracelet.